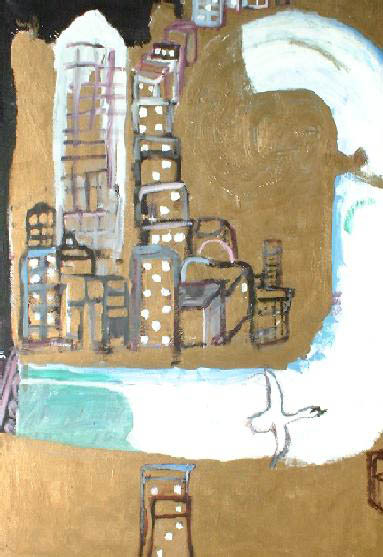 The painting is based in part on the song "Surf’s Up”. Also it draws from Christian and classical themes. 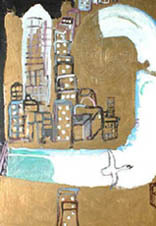 The image shows a cityscape with buildings stacked like dominoes, representing the decadence and decay of a modern society. The gold painted background represents humankind’s achievements, but also it’s materialism and false values. The river, coming out of the darkness, proclaims hope and a renewal of life. The swan adds a sense of poignancy. In Greek mythology Phaethon, friend of Cygnus, fell into the river Eridanus whilst riding the sun-god’s chariot. Cygnus dived repeatedly in vain into the water searching for his friend. Zeus took pity on him and turned him into a swan. It is PARTLY based on the song "Surf’s Up". You can see a cityscape with buildings stacked liked dominoes, ready to tumble. The river flows upwards like a spring of new life, sweeping everything away. The swan represents a feeling of poignancy (i.e. "a muted trumpeter’s swan", my favourite line from "Surf’s Up"). One thing I love about SMILE is all the imagery that it conjurs up. Great subject matter for painting. Note: Click on thumbnail to view full size image.